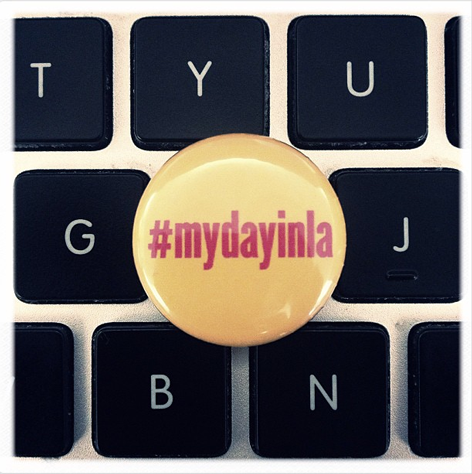 We're excited to have designed a button for Nita Lelyveld's (@latimescitybeat) Twitter movement called #mydayinla which has gained huge momentum and enjoys daily involvement and contributions from people all over the globe. We are thrilled to present our first of many Black Fives® screen printed posters that commemorates Black Fives Day that was celebrated on February 10th of this year. The Barclays Center, home of the Brooklyn Nets, was instrumental in this day featuring mural-sized photographs of teams and players of this era in the concourse of the arena, hosting a community day with Nets player C.J. Watson and the Barclays Center invited and honored over 40 descendants of the basketball pioneers who appeared in each of those images — as well as their spouses, friends, and several other special guests at a halftime presentation during the Nets vs Spurs game. On behalf of Mayor Michael Bloomberg, NYCHA President John Rhea presented the Mayor’s Proclamation declaring February 10, 2013 as “Black Fives Day” in New York City to Black Fives founder Claude Johnson. We are proud to be a small part of this day and look forward to many more like this in the future. 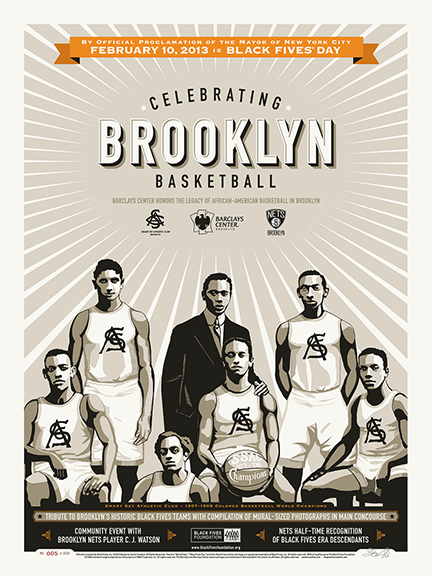 This poster features our rendition of one of the vintage photographs featured in The Barclays Center concourse of The '07 - '08 Colored World Championship team the Smart Set Athletic Club. This limited edition screen print was designed and illustrated by Tom Gundred of Soular Creative under license from Black Fives Inc. and printed by the fine folks at Vahalla Studios. 100% of the royalties from this poster go to the Black Fives Foundation which uses the history of the Black Fives Era to help teach life lessons while honoring its pioneers and their descendants. 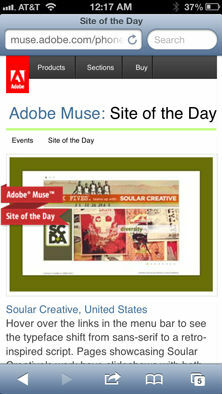 The Soular Creative company site has been featured as the Adobe Muse Site of the Day! (Greenwich, CT) – Greenwich, CT-based vintage sports company Black Fives, Inc. (www.blackfives.com) today announces a new licensing agreement with Soular Creative, a Los Angeles, California-based producer of high-end limited-edition collectible posters. Black Fives, Inc. researches, preserves, honors, and promotes the pre-NBA history of African-American basketball teams – known as the Black Fives Era – in support of leadership training, character development, arts and culture appreciation, health awareness, and community building, in part through its ownership of the intellectual property related to those teams. 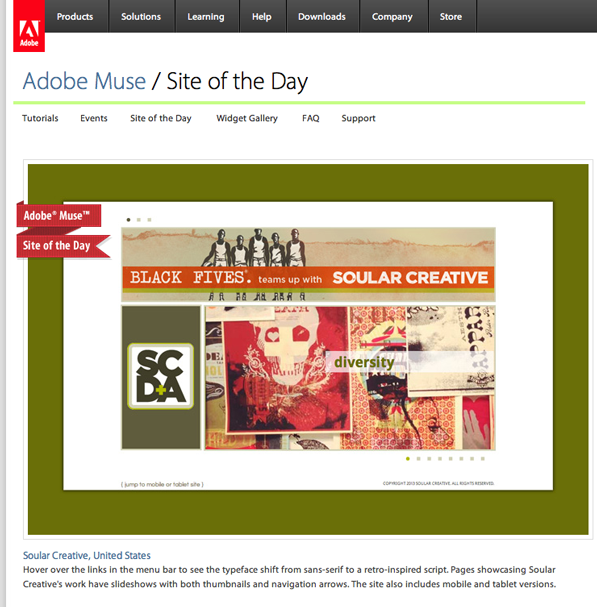 Soular Creative, best known for its award winning creative for video game and film key art as well as for its limited edition posters produced for clients such as Disney, Artcrank, and various musicians, is entering the sports category of printed art with its new Black Fives Collection of vintage inspired designs that celebrate the rich history of pioneering Black Fives Era. 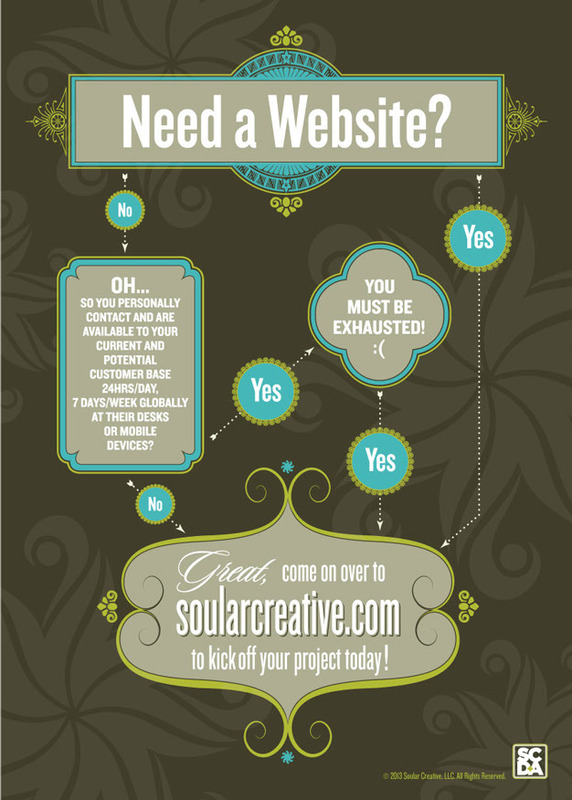 “Soular Creative is best-in-class not only as the producer of creative, memorable graphic designs and premium quality posters but also in terms of our shared vision and outlook for the world and the culture in which we all live in today,” says Claude Johnson, the founder and CEO of Black Fives, Inc.
Soular Creative plans to release several lines of Black Fives Era posters that encompass both team history and individual achievement. The premiere series will feature the New York Rens of Harlem followed by the Smart Set Athletic Club of Brooklyn. The artwork will embody the era through rich color, type style, and the hand crafted feel of screen-printing. These limited edition posters will be signed and numbered by the artist in editions of 100. 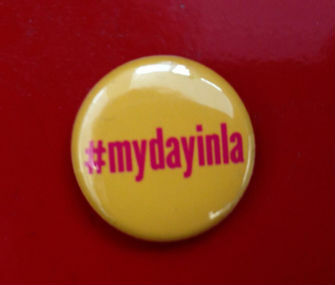 They will only be available for purchase online at www.shopsoularcreative.com.